I am reviewing some long-standing claims of cultural property. Among them is the head from a bronze portrait of Lucius Verus. This is said to be from the Sebasteion at Bubon in Turkey. It surfaced on the London market in the summer of 1970 after being restored by Peter Smith and Anna Plowden (Bernard Weinraub, "Squashed Bust of an Emperor Restored by 2 Young Britons", New York Times 7 June 1970). A representative of Spink & Son suggested that the head had been "excavated in Eastern Europe, probably Hungary, after World War II". 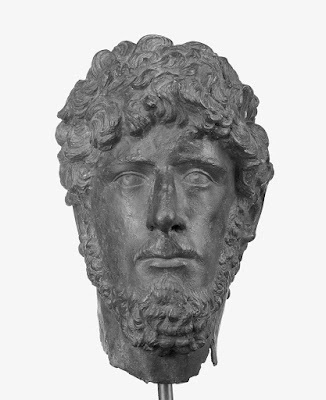 Yet by 1981 Jiri Frel could claim that the head was "said to be from Bubon" (Roman Portraits, no. 62; inv. 73.AB.100). This reflected the research of Jale Inan and Cornelius C. Vermeule. Carol Mattusch in 1996 noted, "Reported to be from Ibecik (ancient Bubon in Lycia), Turkey." The head was acquired by the J. Paul Getty Museum subsequent to the 1970 UNESCO Convention. Will the museum be returning the head to Turkey along with associated pieces?